1) T'Challa got back together with Storm. There, you're all set to dive in! And we strongly recommend that you do so. Black Panther #1 is an absolute blast. When Marvel slaps a $5 price tag on an oversized #1, it's often difficult to say whether or not you get your money's worth. There's no debate here: Black Panther #1 is absolutely worth five of your hard-earned dollars. This story opens with a gigantic context shift that puts us all back to square one. It's a strange new world. We're lost in it and so is our hero. A very Star Wars-esque intro page gives us a skeletal overview: 2,000 years ago, Wakandan exiles founded a space colony. They transmuted their usual interest in isolation into a policy of aggressive expansion - "the best defence is a good offence" style - and now they rule five galaxies. They're casting jealous eyes on our home galaxy, too; all that can stop them is a rebellious slave challenging their order from within. That's right, y'all: Black Panther is doing Space Spartacus. Strap the ☠☠☠☠ in! I'm just bursting with questions about how this story relates to the rest of the Marvel universe. Is this, as the intro strongly hints, the far future? Is this the present day? Alternate Reality? Djalia fever dream? We can't say for sure yet. And here's the important thing: The story's already so good, those answers don't matter. Heck, this issue is deliciously ambiguous about whether or not the protagonist is the same T'Challa we've seen in previous volumes. A lot of this issue's evidence points to this being a long-lost descendant or simply someone inspired by T'Challa. But why, then, would our protagonist be blessed with dreams of a woman with blue cat eyes begging him to come home? Is this T'Challa cast adrift in time? T'Challa dreaming someone else's life? Another character altogether? Again, the answers don't really matter. Maybe I'm speaking too quickly. The answers are going to matter, of course. One of the reasons we have to keep reading is to find those answers out. The key point I'm aiming at here is: This is already a magnificent story regardless of how the continuity questions get answered, and none of the possible answers could spoil the good work Ta-Nehisi Coates and Daniel Acuña have done here. This oversized first chapter is focused on visual storytelling to a surprising degree. Ta-Nehisi Coates's script is confident enough to turn full narrative responsibility over to Daniel Acuña's art at several points. Mr. Acuña flowers under the spotlight, busting out frenetic action scenes that pop with motion and emotion. He has tremendous, fully-earned confidence in how to arrange his panels and characters, and at its best, this story's flow approaches the symphonic. Mr. Acuña's palette is very dark and a little bit restricted. There are a lot of greys and browns on display, relieved by tiny glimmers of colourful electronics and icy blue highlights that scream sci-fi dystopia. It's not like the colours are wrong, though. The grim palette is clearly an intentional choice, and one executed with considerable skill. This issue represents an impressive refinement of Mr. Acuña's painterly techniques that thoroughly, gloriously blur the distinction between linework and colour. While this is an action-heavy start, don't think for a moment that Ta-Nehisi Coates has put his brain into cruise control while scripting it. This comic nails that beautiful mix of shocking thrills and subtle thoughtfulness that you see in top-quality sci-fi movies. It's very similar to Alien or Blade Runner or, yes, Ryan Coogler's Black Panther that way. This issue plants the seeds for a nuanced discussion of imperialism, slavery, and identity without breaking its fighting, running, shooting stride. If you spent hours arguing "Did Killmonger have a valid point? 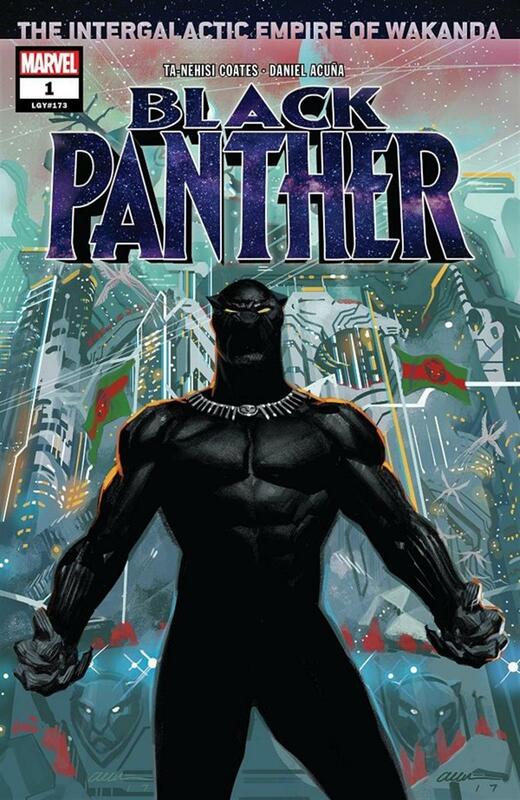 "-type questions after seeing Black Panther in the theatres, this is the exact Black Panther comic you want to read. It also has some top-notch history content delivered with impressive subtlety. While you absolutely do not need to study up to fully enjoy this issue, both you and the author will be very pleased if it inspires you to plug terms like "Maroons" and "Askaris" into Wikipedia. Seriously, seriously, seriously: If you tried getting into Black Panther comics right after the movie and got turned off by the realpolitik, c'mon back now. This is the BP comic you were looking for.